Aizawl, Feb 4 : A roomful of about four dozen women, most in traditional wrap-around and many of them leaders of various women bodies across Mizoram, listened in rapt silence to the female speaker. “Yes, in politics those who are deserving will win. But what we dislike is that without looking at whether or not we are deserving, people say ‘She’s a woman’. This is why so many women do not want to take part, and that is why we need reservation,” female Congress leader Zothankimi held forth. “What is dispiriting is that there are still many women who say they find no reason why we should have reservation,” she continued. 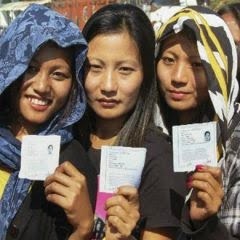 For the gathering, Tuesday’s session was as much a time for venting frustrations at continued discrimination, perceived or otherwise, as well as a training session to assume the mantle of leaders as Mizoram readies to hold local body elections with as much as a third of all seats reserved for women for the first time. Elections to 544 rural and 83 urban local bodies in six of the state’s eight districts are scheduled to be held within the next two months. That seats will be reserved for women in all the rural bodies has already been declared, while the same is expected for urban local body elections soon. The upcoming polls are expected to be pioneering ones in a state where no female was elected to the state legislature for 27 years until the state-wide elections in end-2013 and, even then, the lone female MLA, Vanlalawmpuii Chawngthu of the Congress, was elected in a by-poll to fill a seat CM Lal Thanhawla had vacated to lay claim to his bastion. “Even when women are given tickets by political parties, which seat they contest is always a party decision,” said Dr Jane Ralte when asked what she thought of a female Mizo National Front’s much talked about battle (which she eventually lost) against incumbent Home Minister R Lalzirliana in his bastion in the last assembly elections. “There has been a grudge, that women are used as pawns and given unfavourable constituencies,” said Dr Ralte, who heads the All Mizoram Women Federation that organised Monday’s training session, attended by women leaders from various ethnic groups across the state. The session itself, as Dr Ralte said, was as much about trying to train the attendees to impart further leadership training on others who would file their candidacies for the hundreds of reserved seats the elections will open as it was about trying to instill confidence in as many women as possible. In the group discussions, participants pointed out how they have to try and overcome the conventional view that women are not effective in decision-making positions, jotting down points they believed were a woman’s “weak” and “strong” points, many confining the discussion to perceived personality traits of women in general. Most echoed a view that women should, in general, start acting upon whatever decision-making powers they may attain instead of saying, “There are men to do that”. For many of the participants as well as the organisers, however, “It’s early days yet. It will take time. People should not be judgemental and realise they need to give the novices a chance,” Dr Ralte said.